1986-87 O-Pee-Chee Hockey held its base set at 264 cards. However, a slate of new players into the game and a rising popularity of the sport in the United States was giving it a buzz that would make it a better value compared to already established sports like baseball and football that year. 1986-87 O-Pee-Chee Hockey cards feature a picture of a player, mostly in game-action shots. The O-Pee-Chee logo appears in an upper corner and a solid-colored border surrounds most of the picture. A differently-colored bar appears below the picture, as well as on the right side. The player's name, team and position appear inside the bar at the bottom, and his team's logo is in the lower right corner. Card backs are oriented vertically, and a blue bar at the top contains the player's name. A black circle holds the card number and extends outward in a line that forms the lower border of the blue box. The player's vital stats appear below that, and a light blue box contains the player's year-by-year statistical review as well as a biography in English and French if the stat lines are short. With the smaller set size, there were fewer specialty cards in 1986-87 O-Pee-Chee Hockey than in many previous years. Cards 257 through 264 feature individual league leaders in several different categories. There are also two checklist cards in the set. 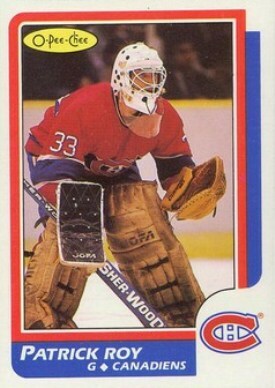 The key card in 1986-87 O-Pee-Chee Hockey is Patrick Roy's rookie. Other notable first-timers include Wendel Clark, Russ Cortnall, Ray Ferraro, Dirk Graham, Petr Klima, John MacLean, Craig MacTavish, Mike Ridley, Gary Suter, Steve Thomas and John Vanbiesbrouck.